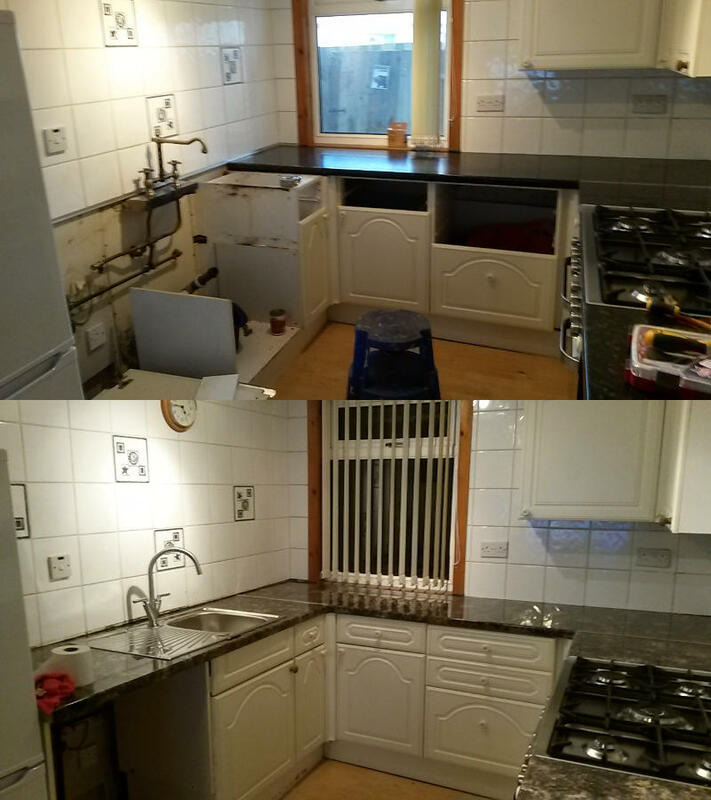 A kitchen refurbishment, at a property in Fallin, new worktops all round. as well as new sink and new tap. Today a client in Stirling had a problem with a toilet cistern fill valve which was faulty, ordered one and fitted it, work as new with minimal cost and inconvenience. A regular customer in Stirling had a leak on the evacuation piping coupling, nothing that resisted Bib’s handy work. A new customer in Dennyloanhead near Bonnybridge needed a couple of things done, a kitchen unit door hinge to be refitted, a plaster wall that needed patched after repairs a door that needed its hinges re-secured as it was catching. Also fixed a leaky toilet cistern. All done and customer delighted, will definitively contact me again when needed! A call from Your Move today asking be to connect a washing machine and a fridge in a flat they are letting out in Bannockburn. The fridge needed to be wired through a wall into a kitchen socket, which required a little engineering, no problem for Bib. All done and packaging taken away also. Hope to get more work from Your Move! A letting agency has hired me to maintain and fix snags and niggles around their properties, this time a leaking radiator in a property in Bridge of Allan needed seen to. Since 26th of August busy on a bathroom refurbishment involving tile removal and new wet wall panel installation. Will make a Post about that project as soon as it is finished. Some picture and brackets (re)fitting as well a seal a shower basin which leaked. Recently build several flat packs, managed to make it 30 minutes faster than the two hours given by the manufacturer, (without power tools). Tomorrow a kitchen sink tap to be replaced and re-seal the basin to a marble top. Sorry I haven’t been able to keep you up to date, it is getting busier and busier for me. I am happy to work quite late in the night if necessary, my Moto is “It’s gotta be done, let’s do it now!” Flat packs, small electrical and plumbing as well as more advanced bathroom decoration is what I do a lot of these days. If you’re moving into Dunblane call me to help organise your new house to how you want it to be, no questions except the best possible advice or work. Fitted a new Toilet and connected it. Job done in 2 hours. Given that there were unknown in the plumbing routes and had to remove/disconnect the old one it was quite quick. Work by Bib’ll Fix it.